This is a great example of why you want to work with a competent attorney if you decide to become an expert witness for court cases. No matter how prepared you are, and no matter how “right” your opinion is… it won’t matter if you don’t ever get to take the stand. procedure of DESIGNATING his expert within the legal time frame. GENE W. ZDENEK et al., Defendants and Respondents. Court of Appeals of California, Second District, Division Two. Abbott Altwiji, in pro. per., for Plaintiff and Appellant. Fonda & Fraser and Craig Donahue for Defendant and Respondent Gene W. Zdenek. Lewis Brisbois Bisgaard & Smith, Howard A. Slavin, Jeffry A. Miller, and Matthew B. Stucky for Defendants and Respondents Kenneth R. Diddie and Edgar I. Thomas. Plaintiff and appellant Abbott Altwiji (plaintiff) challenges a trial court order dismissal following a successful motion for summary judgment by defendant and respondent Gene W. Zdenek, M.D. (Zdenek) and a successful motion to preclude plaintiff’s presentation of expert witnesses at trial by defendants and respondents Kenneth R. Diddie, M.D. (Diddie) and Edgar I. Thomas, M.D. (Thomas) (Zdenek, Diddie, and Thomas collectively are referred to as defendants). We conclude that the trial court properly granted Zdenek’s motion for summary judgment and Diddie and Thomas’s motion to preclude plaintiff from presenting expert witness testimony. Accordingly, the order of dismissal is affirmed. Plaintiff opposed Zdenek’s motion. He did not provide an expert declaration in support of his opposition. Plaintiff claims that he served a supplemental designation of expert witnesses on or about December 2, 2008, but Diddie and Thomas claim they never received it. On December 4, 2008, Diddie and Thomas filed a motion in limine to preclude inquiry into the current medical opinion of undesignated physicians. They argued that since plaintiff failed to designate any expert witnesses on the initial exchange, he should be precluded from presenting expert opinion testimony at trial. Plaintiff opposed their motion, admitting that although he “at first did not want to designate an expert witness[, he] later decided to designate” Dr. Zeegen. Ultimately, the trial court granted Diddie and Thomas’s motion in limine on the grounds that plaintiff did not properly designate expert witnesses. The trial court then dismissed plaintiff’s lawsuit on the grounds that, inter alia, given the nature of plaintiff’s case, expert witness testimony was essential to establish his claims and, because plaintiff failed to properly designate experts, he could not meet his burden at trial. 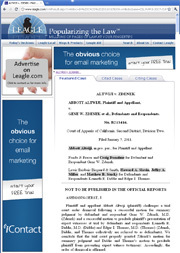 Plaintiff’s case was dismissed, and his timely appeal ensued. Despite being given an opportunity to submit a proper opening brief, plaintiff’s amended opening brief violates California Rules of Court, rule 8.204(a): It does not “support each point by argument and . . . by citation of authority” (rule 8.204(a)(1)(B); see also Benach v. County of Los Angeles (2007) 149 Cal.App.4th 836, 852 [appellant bears the burden of supporting a point with reasoned argument]; County of Sacramento v. Lackner (1979) 97 Cal.App.3d 576, 591 [appellant must present argument on each point made]). It does not “[s]upport [each] reference to a matter in the record by a citation to the volume and page number of the record where the matter appears” (rule 8.204(a)(1)(C)). It does not “[s]tate the nature of the action, the relief sought in the trial court, and the judgment or order appealed from” (rule 8.204(a)(2)(A)). It does not “[s]tate that the judgment appealed from is final, or explain why the order appealed from is appealable” (rule 8.204(a)(2)(B)). And, it does not “[p]rovide a summary of the significant facts limited to matters in the record” (rule 8.204(a)(2)(C); see also Guthrey v. State of California (1998) 63 Cal.App.4th 1108, 1115). The opening brief contains numerous sections, which largely consist of a rambling discussion of plainly irrelevant facts. There is no legal authority; there is no discussion of the procedural history of the case; not until page 14 is there a citation to the record. Worse, both the opening brief and the reply brief are riddled with unfounded attacks on both defense counsel and the trial court. Instead of focusing on these deficiencies, Zdenek’s opposition brief argues why the judgment should be affirmed. Reviewing the judgment de novo (Merrill v. Navegar, Inc. (2001) 26 Cal.4th 465, 476), we readily conclude that the trial court properly entered summary judgment in favor of Zdenek. “`California courts have incorporated the expert evidence requirement into their standard for summary judgment in medical malpractice cases. When a defendant moves for summary judgment and supports his motion with expert declarations that his conduct fell within the community standard of care, he is entitled to summary judgment unless the plaintiff comes forward with conflicting evidence.’ [Citations. ]” (Munro, supra, 215 Cal.App.3d at pp. 984-985, see alsoHanson v. Grode (1999) 76 Cal.App.4th 601, 607.) Here, Zdenek supported his motion for summary judgment with an expert declaration from Dr. Hofbauer. Plaintiff failed to provide a conflicting expert declaration.1 It follows that Zdenek is entitled to judgment. That is exactly what occurred here. Diddie and Thomas demanded an exchange of expert witness information. Plaintiff indicated that he would not be calling any expert witnesses. He was thus precluded from presenting any expert witness testimony at trial. Without requisite expert testimony, it follows that the trial court properly dismissed plaintiff’s action against Diddie and Thomas. The order of the trial court is affirmed. Defendants are entitled to costs on appeal.